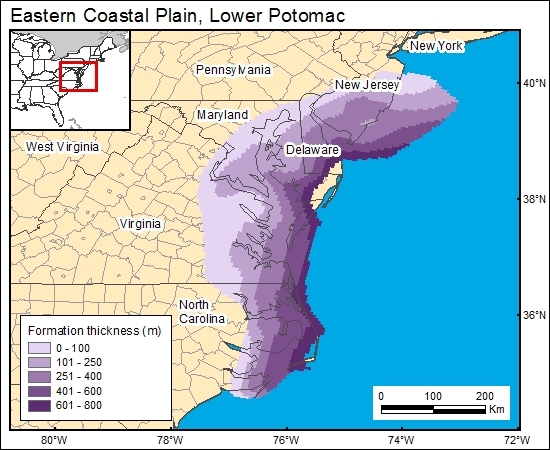 There is no published map showing the thickness distribution of the lower Potomac aquifer in the eastern coastal plain of New Jersey, Delaware, and Maryland (D. Pope, U.S. Geological Survey, personal communication, 2000). Hansen (1984) provided thickness-distribution information for the Waste Gate Formation in eastern Maryland. We used the GIS to calculate the difference in elevation at top of the lower Potomac aquifer (Trapp and Meisler, 1992) and top of basement (Brown and others, 1972) to calculate lower Potomac aquifer thickness distribution (c3potomacg). Brown, P. M., Miller, J. A., and Swain, F. M., 1972, Structural and stratigraphic framework, and spatial distribution of permeability of the Atlantic coastal plain, North Carolina to New York: U.S. Geological Survey, Professional Paper 796, 79 p, 59 plates.